There were, of course a number of blacksmiths in Cheltenham, but the one at Alstone was, for many years, adjacent to the railway, for, in the 18th and 19th centuries, Alstone was still a rural area and transport was still by horse and cart or foot. Only the gentry would have had carriages, but even so their horses would need shoeing from time to time. The blacksmith did not, of course, just shoe horses, but made many other articles, both for the farm and the home. He would make the pot-hooks which hung over the fires, iron dogs on which rested logs in the hearths, pokers, shovels, pans - in fact all the utensils and implements used in everyday life. The smithy in Alstone Lane, may even have made the dog-wheel for Alstone House, where an unfortunate dog ran endlessly to turn the spit. But his main task was the shoeing of horses and he had to be a bit of a farrier as well and often a blacksmith could spot a potential problem with a horse. He would have shod riding horses, donkeys, great cart horses and carriage horses -certainly he is unlikely to have had many idle moments. But in that era of peace he did not, at least, have to turn plough shares into swords. Wherever you found a smithy, so you may have found a wheelwright, for the trades went hand-in-hand. The task of the wheelwright was, like so many early trades, quite skilled and required strength. Apart from repairing broken wagon or coach wheels, he might, if he were skilled enough, have helped to make the wheels for the fast mail coaches which, with the spread of turnpike roads, made travelling much faster and safer. His was an essential trade in those days, just as the car mechanic's trade is today, for only the poorest people walked any distance and were probably healthier for it. In Lower Alstone in the 18th and 19th C, you would have seen wagons carrying coal, wood or produce from the market gardens but the gentry of Alstone House or Alstone Lawn would have had their own coaches to travel about in and of course, the residents in Upper Alstone at Bayshill, would undoubtedly have travelled in magnificent coaches. Neither watermills nor windmills could function without the work of the millwright, for his, too, was a very skilled trade indeed and where one finds mills - a millwright lived close by. Young's millwrights yard was in Mill Lane, close to Lower Alstone Mill and conveniently situated near Upper Alstone Mill, and indeed, Arle Mill, if needed. It was his task, with the help of apprentices to set up the machinery for grinding the corn and a description here will help to understand just how these mills worked. The huge grinding stones were arranged in pairs, circular in shape, one placed on top of the other. The nether stone was securely fixed to the floor of the mill and upon it, the upper stone rotates, both stones being encased in a trough or pan. It is driven by means of a vertical or stone-shaft which is morticed into an iron bar secured in an aperture in the centre of the upper stone. The 'hopper' is a funnel-shaped square box with an opening at the lower part for feeding the grain into the stones. Immediately beneath it is a narrow trough called the 'shoe'. The trough receives the grain from the hopper and conveys it to the aperture in the centre of the upper stone, where it is fed in for grinding. The feed is regulated at the outlet of the shoe which is held close to the stone-shaft by means of a spring. The shaft being hexagonal or octagonal in shape, in revolving knocks and shakes the shoe so that the grain as it leaves the hopper is shaken forward, falls into the stone aperture and is caught between the stones and is ground up. When the grain is ground sufficiently, it passes through another trough or spout into a bin on the floor below, thence through a circular aperture to which is attached a canvas tube which extends to the floor below and into the mouth of the sack which receives the meal or ground grain. As the amount of grain that can be passed through a mill, necessarily depends on the flow of water powering the wheel; or in the case of windmills, the strength of the wind turning the sails; regulation could be tricky. As an example, with one pair of stones, 500 pounds of grist per hour would be the output for a steady wind or flow of water, but in a gale or time of flood, the output could be doubled, Thus it could vary according to the weather. Another regular task of the millwright was the 'dressing' of the stones which obviously wore away over the years. So the millwright was a specialist, and bespectacled to protect his eyes, would recline on some sacking, and with special tools and a mysterious air, would chip away ingeniously at the feathery furrows till they acquired the necessary keenness. Occasionally he would apply the 'staff' smeared with red ochre, to see if the stone was level. Where it was at fault, he would mark this with the ochre and then continue to chip away till the required level was reached. Mill stones would often weight about 15 cwt. - hence the saying 'A millstone around one's neck' when one has a serious problem. In 1871 at Knapp House was Henry Willet, Master Stone Mason who employed seven men and one boy. There is still a stonemason on this site. Perhaps the oldest of skilled trades was that of the stone mason, whose skills were used back in the realms of times when our great cathedrals were built. In those days they had to climb up on wooden and rickety scaffolding to great heights to reach the pinnacles of these lofty buildings and to carve the gargoyles which decorate so many of our ecclesiastical buildings. This, of course, was their finest work, but on a more mundane level they made ancient stone manor houses and bridges and today, this very exclusive craft which led to the founding of the Freemasons, has been partly superseded by the less exalted trade of bricklayer. The stone mason's art can be seen on any church and in any churchyard, in our are and, of course, at the great universities, in Oxford and Cambridge. It was inevitable, since their work required copious amounts of stone, that they tended to live near their supply and since there were no quarries in Alstone, it was rare to find a stone mason in the area. Nevertheless there were a number of stonemasons who worked in Cheltenham during the 19th C who included George Lewis who produced a vast quantity of tombs and monuments before his death in 1868. Also James Brown, a stone carver of some renown who won the contract to carve the caryatids at Montpellier. His son, William Giles born c 1828 probably served his apprenticeship with his father. R L Boulton & Sons, a firm of ecclesiastical sculptors began work in London with branches in Birmingham and Worcester. R L Boulton centralised their business in Cheltenham in 1866 and the fim led the county in the production of stone church furnishings. Today we can see evidence of the work of James Brown in the beautifully carved windows at Highbridge in Malvem Road, which displays his stone-carving skills. He lived in the adjoining house which he also built and let out as a means of income for he and his family. In contrast, however, there were quite a few brick fields in Alstone, one John Cook had a small one, by the Chelt near Alstone House, and John Williams, the coal merchants had a larger brick-field off the Gloucester Road -this being only one of his several enterprises. This site, however, was later sold - part being amalgamated into Malvem Road station and the rest later became the site of Sharpe & Fisher, Builders Merchants who, in turn, gave way to the present owner of the site - Messrs. Travis Perkins, also Builders Merchants. As the 19th C progressed, more and more industry opened up in Lower Alstone, mainly alongside the railways which gave easy access to all parts of the country. Just as important, but certainly not sought after as a living, was the job of Scavenger which dates back well into Tudor times when householders simply threw the contents of their chamber pots out of the window, regardless of who passed below in the street. There the contents together with household waste accumulated in the central gutter which encouraged rats and the spread of disease. But as early as the reign of Elizabeth I the first water closet was invented, but until the early part of the 20th C still many houses could not boast such a facility and many relied on cess-pits which had to be emptied periodically. Other relied on what were euphemistically referred to as 'Thunder Boxes' and usually such privies were at the end of the garden -some, regrettably emptying their contents into the River Chelt. Other rubbish was left lying about until the scavenger came with his rake and bucket to carry out his daunting task of removing all the waste. Not a popular companion, I imagine, with whom to spend much time, but still a very necessary member of the community whose unpleasant task, no doubt, did much to prevent the spread of disease. Not until well into the 20th C were water closets part of the regular sewage system, though even in rural areas, cess pits still existed, So the sight of the scavenger with his foul, smelly clothing, strong boots, sacking hood and trouser tied at the ankles to stop rats shooting up his leg, though not entirely welcomed, nevertheless did a very necessary and important job. We take so much for granted these days and not until there is a water shortage or flood, do we realize how easy our lives have become. A trade nearly as old as farming and milling was that of the fellmonger, which could be defined as a dealer in 'skins' and 'hides' but later included the rendering of bones and fats, and just as the miller relied on the streams, so did the fellmonger to wash the hides. Leather was used for footwear and also for belts and clothes and so a large number of people were involved in this production. In the trade the word 'hide' applied only to pelts of larger beasts such as cattle, horses, buffaloes, whilst 'skins' referred to smaller animals such as calves, goats, sheep and pigs. Curing the hides involved, first of all, the cleansing of the skin and the removal of the epidural system and flesh, whereas tanning involved the use of chemicals - tanning agents etc., and the finishing included the use of lubrication and water-resistant material and dyeing. There was a fell-monger in Millbrook Street whose business backed on to the Chelt, but the chief fellmongers in the Alstone district were based by Lower Mill at the end of Six Chimneys Lane. They took over the premises adjacent to Lower Alstone House and carried on their business successfully for many years and they extended their Fat Rendering Business for they were conveniently placed near the abattoir on Gloucester Road for their hides etc. Had they just stuck to hides and skins, all might have been well, but the rendering of fat and bone brought with it terrible smells which permeated the whole area and was unbearable in summer, Once Six Chimneys Farm House was demolished and dwellings erected in its place, the residents became increasingly angry when the business extended, and the smells got worse. The company originally had 105 employees but redundancies reduced it to 20 by 1992. For over 30 years the council received many letters of complaint. In 1984 there were plans to move the yard to Staverton Airport and five years later there were plans to move it 100 yards away to Tewkesbury Road and later still a suggestion to move it to Stoke Orchard. In 1991 the Supermarket Giants Tesco wanted to build a new superstore in Cheltenham and knock down the town's controversial skinyard. Tesco had put forward two alternative projects for the skinyard site and they had the option to buy the land. One would cover seven acres and take in the skinyards well as Graham Manufacturing. The store would have a floor space of 60,000 square feet and parking for 606 cars, and the second option would stretch over the skinyard site and area occupied by the Texas Homecare site and would cover 8.25 acres and include 70,000 square feet of selling space and parking for 735 cars. Since the Borough Council and the residents in the area would welcome any scheme which took away this 'thorn in the flesh', the closure of A H Taylor went ahead and in May 1992 it finally closed down. Part of the former site gave way to warehousing and Tesco developed their store as planned. So once again, this backwater in Alstone changed almost completely and the recent work by the Environmental Agency plus the on-going work in Collets Drive, will bring about further changes this time - one hopes - for the better. Coal was mined as long ago as Roman times in the Forest of Dean, and indeed much of the early supplies used by the Cheltenham Gas Works in the 19th C came from the Forest and later from Derbyshire and Staffordshire. However, though it had long been burnt in the hearths of both rich and poor, it would not have been needed in very great quantities until the late 18th C and early 19th C when the development of the railway which cut across Lower Alstone. The advent of the railway meant that much greater supplies could be brought into the town and indeed into the heart of the industrial areas. Prior to the railway, the tram road, which ran from the gas, works adjacent to the new Gloucester Road, delivered to wharves on Tewkesbury Road and on the corner of Market Street. The newly built Gasworks with its increased demand for, coal attracted the attention of local entrepreneurs, one of whom set up business in Lower Alstone. This business which was set up by the level crossing in Alstone Lane, had a sidings leading from the main track and coal wharves adjacent to the railway The business was owned by John Williams, a former brush maker who lived in the High Street. He and his family are shown on the 1841 census living in the High Street, but by the late 1850's they had moved to Alstone Manor House, presumably, to be near his business. Sadly the Manor House was demolished at the beginning of the 19th C and all we have left is a description given in Sales Particulars in the late 19 C.
The manor house used to be on the corner of The Croft and Alstone Lane and the grounds extended to Sandfield Road (now Arle Road). New houses and the playing field now cover the former site. John's two sons, John Henry and Frederick no doubt helped in the business in a managerial capacity but it was his son-in-law, John Nicholson, who married his eldest daughter, Matilda, who seemed to have taken over the management of the business in Alstone after 1870 when John Sr. died. The business flourished and branches were opened in Worcester, Bredon, Pershore, Eckington, Defford, Malvem, Gloucester and Bristol. There was also farm stock at Norton and a brickyard in Alstone. In addition John Williams also owned the Derby and Staffordshire Arms which used to stand opposite the Manor House, but it too, has long since been demolished. He also owned the brickyard on Gloucester Road adjacent to the Foresters' Arms which he also owned. John Williams Sr. died in 1870 and his glowing obituary did justice to this very popular and successful businessman who found time to serve on the Board of Commissioners and the Board of Guardians. The business continued for several years under the management of John Nicholson. John Nicholson, Matilda and their family lived at Newcome Cottage which used to be next to the Derby and Staffordshire Arms and next to one of the first infants schools set up in Cheltenham. For some reason Newcome Cottage later became known as The Bramery which name still exists in the area, though, like the other premises, it too disappeared at the 1930's It is now the site of a. small business estate. Where the coal wharf once was is now a Trade Park stretching back some way to reach what was once The Vineyards. There can't be many older Cheltonians who have not heard of John Higgs who died 1825 and who was famous for killing pigs. His tombstone still lies in St. Mary's churchyard, though much worn away. Pig-keeping was quite common in the 18th and 19th centuries, and not just in rural areas either for the Cheltenham Borough Council minutes show that several complaints were made about the noxious odours emanating from various properties; some in the centre of the town. But an ancestor of the above John Higgs living in Alstone in the 19th century, evidently followed the family tradition. Though the Higgs family seem to have been almost as prolific as the Cook family, they seem to be concentrated within the southern area of Alstone Lane, for the will of one Simeon Higgs, yeoman of Alstone, dated 10/3/1824, refers to his six cottages and tenements with the gardens situate in Alstone, which were left to his wife, Sarah, during her lifetime: the rents and profits of such premises to be used for their children's upkeep. He gave the cottage wherein he then lived and half the garden with the pig sties and also the adjoining cottage occupied by one Thomas Morris, plus rights to front and back roads, to his eldest son, Emanuel, he paying the sum of £30 to his brother Henry. Simon also devised the cottage wherein one Susan Hill dwelt and the other half of the garden and two other pig sties and cottage adjoining in which William Witfield resided plus the rights of way, to his second son, George, he also to pay out £30 to his sister, Sarah. A cottage wherein one Mary Simmons resided and the garden on the west side was to go to his son Henry and a cottage where Thomas Wilks lived, with its garden ground on the east side was to go to his daughter Sarah. So evidently pig-keeping was well-established in the area. Simeon's goods, furniture and other effects were to go to his wife but after her decease they were to go to his children and he appointed Thomas Cook of Alstone to be guardian of his children during their minorities. To this will he put his mark, ' X'. Alstone, at that time, was a close-knit community and as the Cook family was living in the same area, no doubt they were very friendly and could call on one another when the occasion arose. Although, sadly, the Higgs Cottages are long gone, we can pin-point them from early maps and other documents. The exact age of the cottages is not known but presumably they were built at some time in the 18th century on land adjacent to the site which became part of Alstone Lawn. It is inconceivable that the original owners of Alstone Lawn would have permitted a row of cottages with their pig-sties to be built in a corner of the estate so it is believed the cottages must have existed first. A descendant of this family says family tradition has it that both Emanuel and his brother George fell in love with the same girl but that she chose Emanuel. It seems that George never got over his love for Rhoda, wife of Emanuel, for he never married. It is evident that George must have acquired the cottage nearest to Alstone Lawn as the census returns show he too was a pig keeper for on 24/6/1862 Mr. F La Terriere of Alstone Lawn wrote to the Council asking the Sanitation Commissioners to look into the over-crowded state of the nearby cottages and the number of pigs being kept. He pointed out that they must be a hot-bed of disease and commented that children in the neighbourhood were dying of disease. Since the likely culprits were said to live within 30 yards of his house, evidently he was referring to George Higgs and his brothers and it must be said that Mr. La Terriere's concern was justifiable, and his fear of typhoid due to insanitary conditions was strengthened because only the year before, Prince Albert, consort of Queen Victoria, had died of that disease, due, it is said, to faulty drains at the palace. So whether palace, lowly cottage or mansion, the spread of disease in those days was of concern to everyone. George Higgs wasn't the only culprit in the area for Mr. L Terriere also complained of a Mr. Boodle, but whether the pig population was reduced is not known. Suffice it to say that the last Higgs in the area, who moved to Arle, also kept pigs. George and his brother continued to live in the area though others of the Higgs family moved to Birmingham. George Higgs died 4/2/1877 and his will makes his friend, Walter Cook of Alstone, and William Westcott of same place, trustees to see his will performed. The will refers to 1 Higgs Cottage plus 1/9th share of a garden ground which he left to Mary, wife of brother Emanuel, so it seems he still had feelings for her. His remaining properties, namely 2, 3, 4, 5,6, 7 and 9 Higgs Cottages plus sties and gardens, he left to various nephews and nieces. He also left Orchard Cottage and No 3 Littles Row, New Street and West Cottage, Alstone to relatives. The will was made on the 22nd March 1873 and was signed by George, so it seems the Higgs family owned several cottages both in Alstone and elsewhere which would suggest that pig-keeping was a profitable business. Regrettably no photographs of the cottages have survived but Mrs. Lukerman, a descendant of the William who moved to Birmingham recalls visiting the cottages as a child. She says her grandfather's cottage had a stable-door and was very cramped. She wondered how the families fitted in, so perhaps the comment about over-crowding was justified. Grampy Higgs as Mrs. Lukerman called him seemed to be quite a character. He lived alone after his wife, Harriet died, and one of his daughters who lived opposite would cook Sunday dinner for him. Grampy Higgs was also very fond of his tipple and over indulged on occasion and at such times was wont to pull the tablecloth off with dire results to the crockery and one day his sister Rosa was visiting and gave him 'the biggest telling-off of his life'. There was no more smashed crockery. However, an earlier episode serves to show the importance pigs played in the lives of the neighbourhood for Harriet recalled being awoken early one Sunday, about 6 am, and on looking out of the window, saw a man she knew who told her that his pig was farrowing and could William come and help? Harriet replied that she would have to see what sort of mood William was in but William agreed to help and after a cup of tea and a bite to eat, went off with the man. He told the chap to return in two hours' time and when he did he was over-joyed to see the pig and piglets all safe and sound. After all, pig-keeping was their livelihood and they could not afford to lose even one. 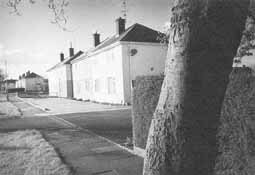 The Higgs continued to occupy their several cottages, but by 1932 Alstone Lawn was derelict and the Council purchased the land to build the housing estate which became Pates Avenue in memory of Richard Pate. The mansion was by then in a ruined state after having been set fire to by Suffragettes and no doubt, the survivors of the La Terriere family were glad to dispose of the site, but it was some time before building went ahead and the problem of Higgs Cottages 'protruding into the estate' had to be dealt with. By then the Higgs family were somewhat scattered and their cottages too were in a poor state. The Council applied for a Compulsory Order so that the completion of the Pates Avenue estate could be completed. The amount decided as compensation was, as the descendant puts it - derisory. This would seem so because the sum to be divided between the 22 various owners - all living elsewhere at that time, amounted to £140. 5. 10d. ; the Corporation to pay costs of clearing the site and the Surveyor's fees. This was reluctantly agreed to in 1940. In the 1960 'Graphic' we read an article in which the writer of the article had met a descendant, then aged 73 and living in Hesters Way Cottage. Albert Higgs, was his name and his older brother, Ernest was then of 48 Alstone Lane and both he and Albert were pig breeders. Ernest and his wife Evelyn resided at 4 Higgs Cottages in 1920 but by 1944 had moved to Browns Cottages, Arle, and when the Hesters Way estate was commenced, they moved to Hawthorn Road. I am sure, there are still descendants of this large and well-known family still living in Cheltenham who may recall, with affection, the Higgs Cottages and their former owners in Alstone Lane. The land on the north-west side of Cheltenham has always been excellent for cultivation and in the early 19th Century, Lower Alstone, in particular, seemed to have lent itself to extensive market gardening. The land from Gloucester Road to the Arle border on both sides of what was then called Sandfield Road (now Arle Road) and Alstone Lane and extending westward to St.. Marks was predominantly given over to market gardens. There were, however, only a very few families who cultivated this land - perhaps the most dominant one was the Cook family. Although the Cooks had lived in the area for many, many years, it is only from the early part of the 19th Century we discover, from the census returns, that the descendants of one Thomas and Anne Cook made their living as market gardeners throughout the whole of the 19th Century, and indeed into the early part of the 20th Century. Thomas and Anne had inherited the land and property from his father, William and it is fairly probable that they inherited the three cottages mentioned in Thomas's Will, though they are not identified. We do know that at least three of their sons lived in the Sandfield area or Rowanfield and in turn, their sons carried on the same business. The early 19th Century was a time of great expansion in the population of Cheltenham and the increased population needed the food the market gardeners could produce. It was very productive land and they all seem to have made a substantial living out of it though the work must have been hard. Daniel Cook, eldest son of George and Jane resided at Lower Alstone House - an ancient house dating back to the late 17th or early 18th Century. The land stretched from the house on the banks of the Chelt to Sandfield Road, where later, on the land fronting the Road, other Cooks worked the land at Sandfield Villa and Sandfield Cottage. In the 1830's they would have seen the land, bisected by the railway, for Jesus College, Oxford, who owned large tracts of land in the area, sold a proportion to the Railway Company. On the other Side of Sandfield Road, Arle Gardens was cultivated by a grandson of Daniel - one Albert Frederick Cook. The family remained there till the 1940's when a substantial piece was sold to Elliot Brothers who wished to extract sand. This area is now St. Benedict's School playing field. The rest of Arle Gardens was sold to Dare's building firm for housing. Adjacent to Arle Gardens was Brighton Gardens, owned in the mid 19th Century by a grandson of Thomas and the Cooks remained in possession until the very early part of the 20th Century, when it came into the possession of the Bellamy family; two of whom married Cook girls. The Bellamys carried on the business as market gardeners till after WWII but in the 1960's most of the land was sold for housing and now forms Netherwood Gardens. The Bellamys continued to reside in the old House until it too, was sold in the late 1980's when it was proposed to demolish the house and build more houses. However, local protests prevented this and the old house in Brighton Gardens, remains, much restored though the adjoining land was built on. At the same time as the Cooks were cultivating much of the area - newcomers - the Sindry family bought Brooklyn Gardens and had a flourishing fruit business for many years, and, like the Cooks, the sons and grandsons carried on the business in the area - two moving into Rowanfield and another to Swindon Village. On the Western side of Alstone lane, another Cook owned a market garden at Sandfield House which was not far from The Shallows where the Smith family lived.. One earlier descendant of George Cook moved to Chosen View in Swindon Lane and yet another lived at Swindon Gardens on the Tewkesbury Road. Sadly, like so many places, bit by bit, the land was swallowed up for housing or industrial estates though there are still two or three patches of green land left in Alstone Playing Field, St. Benedict's Playing Field, and Rowanfield. But throughout the 19th Century the land had given good homes and excellent living to the Cooks, the Sindrys and the Smiths and as market gardening families, they tended to inter-marry with other market gardeners, but they have all scattered - their land swallowed up though a few of their old homes still remain as reminders of that prosperous age. Whilst the Cook family were cultivating much of Sandfield, Rowanfield too was a vast area of market gardens which stretched from Rowanfield Road to the border with Arle. There were several market garden families in that area. Two of the Brooklyn Garden Sindrys held market gardens off Rowanfield Road at Rowanfield Gardens and Sydney House whilst adjacent to them lived the Bootes who lived at The Chestnuts and Somerville. From Rowanfield Road opposite what was the road leading from Gloucester Rd. to the Vineyards, the road continued into the heart of the estate which joined another road, leading from Alstone Lane. One of the oldest properties was The Shallows where Mr. Henry Smith resided. He had inherited the property from his father when he was just 21 and lived their all his life. It is believed the then property dated from the 1840's and it was approached by a long dark lane overshadowed by big trees which gave it a very eerie appearance and was approached at night with some trepidation. Nearby, on the corner of Alstone Lane was South Bank, where the great uncle of Mr. Smith lived and where he, Thomas Smith, lived till his death, when the Cook family took over. Beyond The Shallows were two other properties, namely, Farmville and Coversted. The house called Covertsed is referred to in local records dating from 1629 when it is referred to as Coversteed in Rewenfield (GRO D38 T3/4). Originally those properties would have been part of the open field system before the Enclosure Act of 1832. Fronting Alstone Lane were other properties such as Sandfield House, occupied in the 19th C by the Cook Family and adjacent, Lucinia occupied by the Tawney family one of whose daughters married George Cook. Most of the little cottages at that time, had quite extensive gardens at the rear and it was common for them all to be supplied with water from a pump. Indeed some retained their pumps until, the 1950's. Most of the land was devoted to the growing of fruit trees but vegetables and poultry rearing also formed part of their living. And so it might have continued but in the post war era in the 1940's, the council was looking for land to develop the large housing estates which were urgently needed and so Rowanfield, like Hesters Way became the subject of Compulsory Purchase Orders. Below is an extract from the Council Minus of 1948. Also purchased was Sandfield House, then occupied by Mrs. M Cook, but since the acreage of each plot is not given, we can only guess from the compensation paid, at the size of the land. Suffice it to say, that clearance and building went ahead and the total units on the Rowanfield Council Estate was about 403 houses and 85 flats, though later several of the houses were bought under the 'Right to Buy' in the 1980's. Today, little can be seen of this once flourishing market garden land. Certainly some green belt is left, in the playing field of Rowanfield School and the playing field off Brooklyn Road, but if you want to see the remnants of old Rowanfield, you need to wander along Rowanfield Road where many old cottages still survive.